Miele, the world’s largest family owned and operated appliance manufacturer, is the Official Home Appliance sponsor of The World’s 50 Best Restaurants 2016. In addition, Miele has sponsored the One To Watch Award, which was presented to Tokyo-based Den at last night’s celebration. 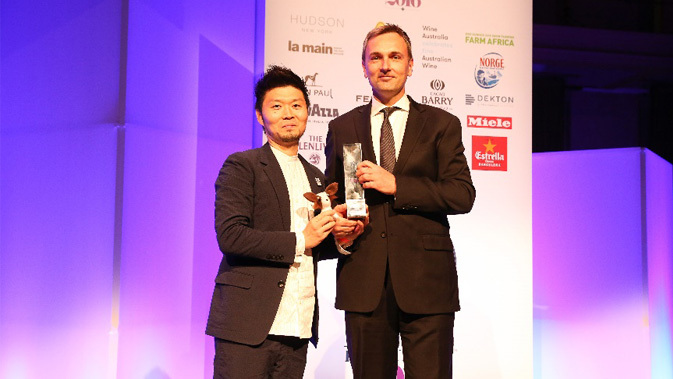 Christian Schwarz, Vice President of Marketing at Miele, presented the award to Den’s chef-owner Zaiyu Hasegawa last night at Cipriani Wall Street in Manhattan, marking the first time the event was held in New York. At the event Miele took guests on a culinary adventure, encouraging patrons to learn and explore through food. Inspired by flavors around the world, Miele’s standout origami wall contained removable recipes, revealing an impressive backdrop of culinary creations. Inviting everyone to push their boundaries and participate in this journey, guests were urged to share their own creations and photos at #MyCulinaryAdventure and @MieleUSA. This is the first year in which Miele has been a part of The World’s 50 Best Restaurants, one of the most important events in the culinary world. The event was attended by the most notable and influential chefs in the world, other professionals in the food sector and major international media. Visit http://culinaryadventure.mieleusa.com/ for videos and more information. Founded in Germany in 1899 with a single promise of Immer Besser, a phrase meaning Forever Better, Miele has dynamically grown to become the world’s largest family-owned and operated appliance company with more than 16,600 employees, 12 production facilities and representation in nearly 100 countries. As a premium appliance brand represented on all continents, Miele is steadfastly committed to the highest quality, performance and environmental standards. Miele’s range of exceptional consumer appliances includes: vacuum cleaners; laundry systems; rotary irons; dishwashers; ranges; built-in convection, speed, steam and combi-steam ovens; cooktops; ventilation hoods; refrigeration; wine storage and espresso/coffee systems. To learn more, visit www.mieleusa.com, www.facebook.com/mieleus, www.youtube.com/mieleus and follow us @MieleUSA. Founded in 2002, The World’s 50 Best Restaurants list is created from the votes of an influential group of almost 1,000 international leaders in the restaurant community. The World's 50 Best Restaurants 2016 list was announced at the annual awards ceremony on June 13th, which took place in New York for the first time this year, at Cipriani Wall Street.